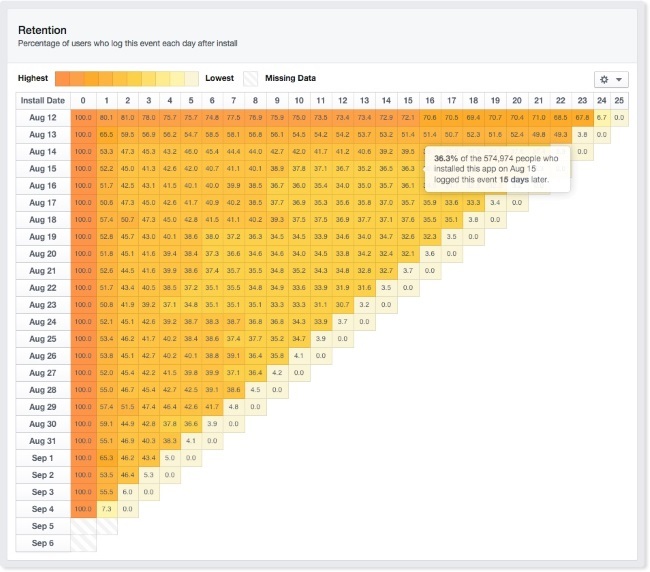 Facebook announced the launch of two new tools within its App Insights for developers: label cohorts, which allow developers to create groups of users within their applications and compare statistics such as revenue and time spent with their full user bases; and retention charts, which allow them to analyze retention of their apps’ users over time and determine the effects of changes to those apps. The social network said in a post on its developer blog that these new tools are available for both Facebook and native mobile apps, adding that its app events measurement capabilities are now available for apps on Facebook. We’ve made it easier for you to understand the performance of your app by introducing label cohorts. Label cohorts allow you to categorize groups of people who use your app and measure important factors, like revenue or time spent in the app. For example, you can create label cohorts to automatically follow a group of people who installed your app from a specific ad set, so you can understand how much time that group spent in your app and how much money they spent through in-app purchases. Another key benefit is the ability to A/B test various tactics. With label cohorts, you can test different tactics with two different groups and then measure which performs best. For example, you can provide 10 percent of people with a free item within your app, and then measure whether that group spends more than people who didn’t get the free item. This is just one of the many strategies this new insight can unlock — it gives you the flexibility to define your own cohorts, which makes App Insights more powerful in building your apps and measuring growth. Install source cohorts: You can group people by the source from which they installed an app — e.g., Facebook ad, organic, request, etc. — and measure which source brings you the people who spend the most. Action-based cohorts: You can group people who have taken a certain action in your app. For instance, this could be a group of people who’ve reached a certain level in your game, so you can compare that group to a group that’s reached a different level to see who spends more. Time-based cohorts: You can group people who have installed your app in a specific time frame. For instance, you could compare people who installed in June versus July, and see which group spends more time in your app for each month. 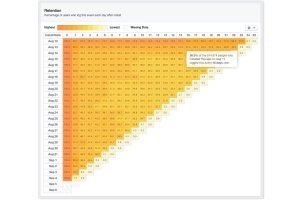 Story-based cohorts: You can track impressions that you receive from posts to Facebook by people within a particular group, allowing you to determine which groups post the most, or which post the most successful stories back to Facebook. Create your own: This is a flexible system that allows you to test downstream actions and conversion events for groups of people using your app based on whatever criteria you choose. We created a visual way for you to measure how people use your app, based on when they installed it. Our new app event retention charts will show you what percentage of people took an action for any number of days after installing the app, up to 14 weeks after the install date. With this data, you can determine if certain changes you made to your app resulted in a significant change in engagement. From there, you have the option to run ads or make other changes as a result of knowing this granular, time-specific information. In order to take advantage of this feature, you must be logging app events with Facebook. One way to take advantage of this is with the “app activate” event, which registers a session each time someone opens your app. For example, if a large percentage of the people who installed your app July 18 continued to open the app (“activate app”) for several days after installing, you can then use this information to understand what may have caused the increase (or decrease) in retention. For instance, you could measure the impact a sale or an app update had on retention of people using your app. The retention chart is available for all of the events you log. If you are also logging purchases, you can see what percent of people are making purchases on the day they installed the app, and what percent of people are making purchases on any number of days (up until 14 weeks) after installing the app. If your app is logging “level 20 complete,” you can see the percentage of people who completed level 20 after day 60 to understand how difficult your app might be. All of these insights will now enable you to enhance your current app strategies to improve the performance of your app. Developers: What are your initial thoughts on these new tools?